English: Detail of the central part of the awards which were circulated to the "liquidators" of the Chernobyl disaster. 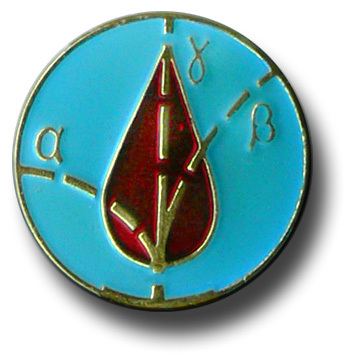 This pattern represents a drop of blood through the radiation signs of alpha, beta and gamma. These workers were requisitioned by the authorities, and they have been exposed to high levels of radiation because of these assignments. Español: Detalle de la parte central de la medalla que se hizo circular entre los Liquidadores del desastre de Chernobyl. Esta figura representa una gota de sangre atravesada por las radiaciones con los signos griegos de alfa, beta y gama. Estos trabajadores fueron requeridos por las autoridades y se expusieron a altos niveles de radiación a causa de este trabajo. Deutsch: Detail des zentralen Teils der Auszeichnung, die an die "Liquidatoren" von Tschernobyl ausgegeben wurde. Er zeigt einen Blutstropfen und die Zeichen radioktiver Strahlung, Alpha, Beta und Gamma. Die Liquidatoren waren bei ihrer Arbeit einem hohen Maß an Strahlung ausgesetzt.